Problems on tomato stems can mean the onset of a disease, an attack from a tomato pest, or conditions that can lead to trouble. Healthy tomato stems are green, thick, and sturdy. Look for these red flags on your tomato stems to quickly identify problems. 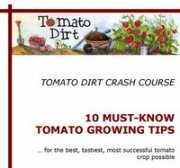 Get your free copy of "10 Must-Know Tomato Growing Tips." This 20-page guide is filled with tips you need to know to have a successful tomato crop, whether you’re a beginning or experienced gardener. Stake plants to allow good air circulation to stems. Water at the base of plants. Overhead water spreads disease easily. Water in the morning or midday to minimize the amount of time leaves are wet. Monitor plants daily to check for pests. Avoid working on plants when leaves are wet. Remove and destroy affected plants at the end of the season. Solarize soil at the end of the season to destroy soil-borne fungi and bacteria. Are There Problems on Your Tomato Stems? Is there a problem on your tomato stems? Explain what the problem looks like. Share what tomato variety you’re growing and when you first noticed the problem. While you’re at it, describe your growing conditions, the weather, and how much water your plants have had. Any details you can share will help us help you! Why are my tomato stems going black? What In The World Is On My Tomato Stems? © Copyright 2010-2019. TomatoDirt.com. All rights reserved. No reproduction without permission.